Download "2.3. Finding polynomial functions. An Introduction:"
1 2.3. Finding polynomial functions. An Introduction: As is usually the case when learning a new concept in mathematics, the new concept is the reverse of the previous one. Remember how you first learned addition and then you learned subtraction or first you learned multiplication and then you learned division. Each operation being the opposite of the other. Yet another example is one in which you learned the properties of exponents and then you learned about radicals or rational exponents. Well, finding polynomials is the reverse of finding factors. In the previous lesson, you were given a polynomial and asked to find its factors and zeros. 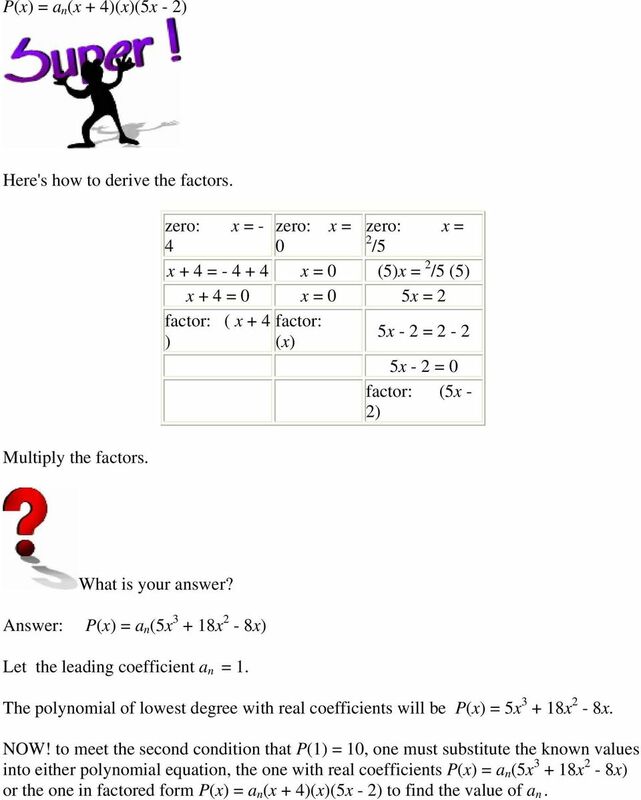 In this lesson, you will be given factors or zeros and asked to find the polynomial of lowest degree with real coefficients. Example 1: Given the factors ( x - 3) 2 (2x + 5), find the polynomial of lowest degree with real coefficients.let's analyze what we already know. ( x - 3) 2 is a repeated factor, thus the zero 3 has multiplicity of two. Did you know that the linear factorization theorem states that a polynomial of degree n has precisely n linear factors. And since we have been given three linear factors, the lowest degree of this polynomial must be three. Rewrite the factors to show the repeating factor. Write factors in polynomial notation. The a n is the leading coefficient of the polynomial ( x - 3)( x - 3)(2x + 5) P(x) = a n ( x - 3)( x - 3)(2x + 5) Multiply ( x - 3)( x - 3) P(x) = a n ( x 2-6x + 9)(2x + 5) Then multiply ( x 2-6x + 9)(2x + 5) P(x) = a n (2x 3-7x 2 + 8x + 45) For right now let a n = 1 P(x) = 2x 3-7x 2 + 8x + 45 Thus, the polynomial of lowest degree with real coefficients, and factors ( x - 3) 2 (2x + 5) is: P(x) = 2x 3-7x 2 + 8x So, what did you learn from this example? 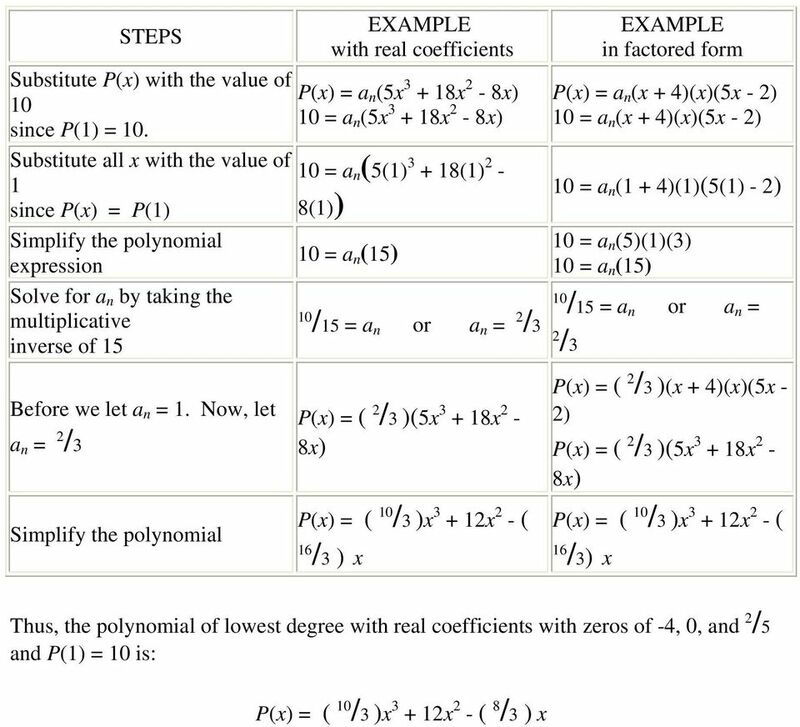 2 The main concept is simply to multiply the factors in order to determine the polynomial of lowest degree with real coefficients. Example 2: Find the polynomial of lowest degree with real coefficients given the zeros of -2, 3 /5, and 4 (multiplicity of 3). What is the lowest degree of the polynomial? say 5? Let's analyze what we already know. The polynomial is of degree 5 since x = -2 occurs once, x = 3 /5 occurs once, and x = 4 occurs three times. Remember, a polynomial of degree n has at most n distinct zeros. Write the zeros as factors for x = -2, x = 3 /5, x = 4 (multiplicity of 3). How are factors written? Look at the steps below for the zero, x = 3 /5. 1. Take x = 3 /5 multiply both expressions by the denominator 5. 5(x) = 3 /5 (5) 5x = 3 2. Do the additive inverse of 3 to get the expression on the right equal to zero. 5x - 3 = 3-3 5x - 3 = 0 3. Write the left expression in parenthesis as a factor (5x - 3) Write the other four zeros as factors. 3 YOUR ANSWER: All five factors are (x + 2)(5x - 3)(x - 4)(x - 4)(x - 4). Write the factors in polynomial notation. P(x) = a n (x + 2)(5x - 3)(x - 4)(x - 4)(x - 4) where a n is the leading coefficient of the polynomial. 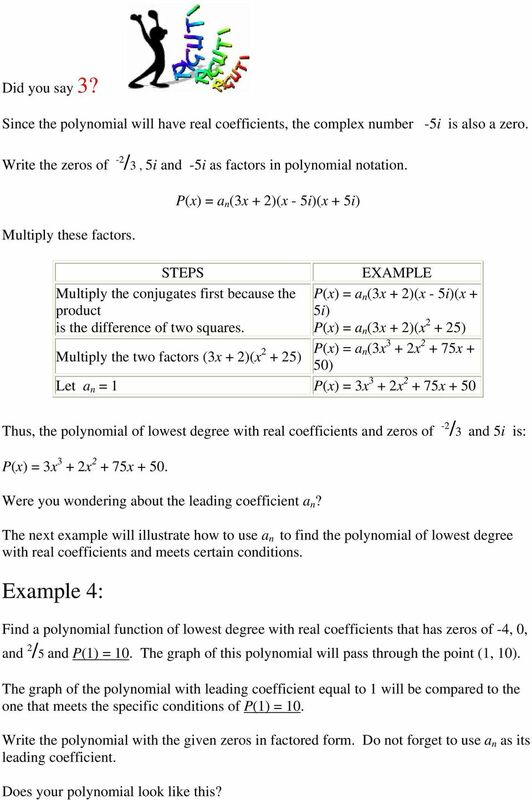 Multiply all factors to get the polynomial with real coefficients. Multiply two factors at a time. Start by multiplying (x + 2) (5x - 3). Multiply the two factors (5x 2 + 7x - 6)(x - 4) or (x - 4)(5x 2 + 7x - 6) since multiplication is commutative. Multiply the two factors (5x 3-13x 2-34x + 24)(x - 4) Multiply the two factors (5x 4-33x 3 +18x x - 96)(x - 4) Let a n = 1 Thus, the polynomial of lowest degree with real coefficients and zeros of -2, 3 /5, and 4 (multiplicity of 3) is: P(x) = a n (x + 2) (5x - 3)(x - 4)(x - 4)(x - 4) P(x) = a n (5x 2 + 7x - 6)(x - 4)(x - 4)(x - 4) P(x) = a n (5x 3-13x 2-34x + 24)(x - 4)(x - 4) P(x) = a n (5x 4-33x x x - 96)(x - 4) P(x) = a n (5x 5-53x x x 2-736x + 384) P(x) = 5x 5-53x x x 2-736x What happens when the zeros are complex numbers? Example 3: P(x) = 5x 5-53x x x 2-736x Given the zeros of -2 /3 and 5i, find the polynomial of lowest degree with real coefficients. What is the lowest degree of the polynomial? 4 Did you say 3? Since the polynomial will have real coefficients, the complex number -5i is also a zero. Write the zeros of -2 /3, 5i and -5i as factors in polynomial notation. Multiply these factors. P(x) = a n (3x + 2)(x - 5i)(x + 5i) Multiply the conjugates first because the product is the difference of two squares. P(x) = a n (3x + 2)(x - 5i)(x + 5i) P(x) = a n (3x + 2)(x ) Multiply the two factors (3x + 2)(x ) P(x) = a n (3x 3 + 2x x + 50) Let a n = 1 P(x) = 3x 3 + 2x x + 50 Thus, the polynomial of lowest degree with real coefficients and zeros of -2 /3 and 5i is: P(x) = 3x 3 + 2x x Were you wondering about the leading coefficient a n? The next example will illustrate how to use a n to find the polynomial of lowest degree with real coefficients and meets certain conditions. Example 4: Find a polynomial function of lowest degree with real coefficients that has zeros of -4, 0, and 2 /5 and P(1) = 10. 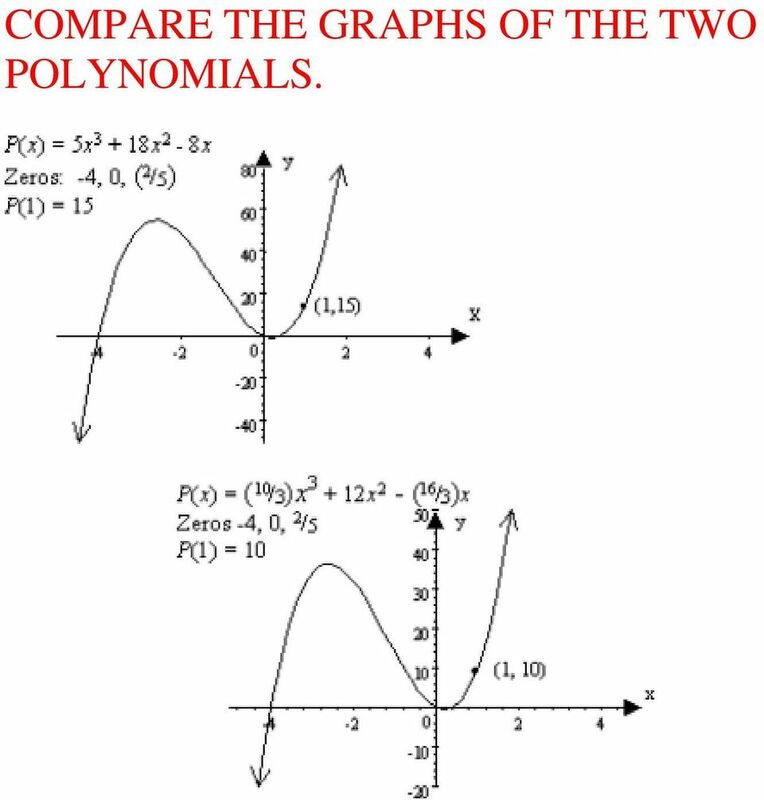 The graph of this polynomial will pass through the point (1, 10). The graph of the polynomial with leading coefficient equal to 1 will be compared to the one that meets the specific conditions of P(1) = 10. Write the polynomial with the given zeros in factored form. Do not forget to use a n as its leading coefficient. Does your polynomial look like this? 5 P(x) = a n (x + 4)(x)(5x - 2) Here's how to derive the factors. Multiply the factors. zero: x = - zero: x = zero: x = /5 x + 4 = x = 0 (5)x = 2 /5 (5) x + 4 = 0 x = 0 5x = 2 factor: ( x + 4 ) factor: (x) 5x - 2 = 2-2 5x - 2 = 0 factor: (5x - 2) What is your answer? Answer: P(x) = a n (5x x 2-8x) Let the leading coefficient a n = 1. The polynomial of lowest degree with real coefficients will be P(x) = 5x x 2-8x. NOW! to meet the second condition that P(1) = 10, one must substitute the known values into either polynomial equation, the one with real coefficients P(x) = a n (5x x 2-8x) or the one in factored form P(x) = a n (x + 4)(x)(5x - 2) to find the value of a n.
7 COMPARE THE GRAPHS OF THE TWO POLYNOMIALS. The degree of a polynomial function is equal to the highest exponent found on the independent variables. 8-6 Radical Expressions and Rational Exponents Warm Up Lesson Presentation Lesson Quiz Holt Algebra ALgebra2 2 Warm Up Simplify each expression. 1. 7 3 7 2 16,807 2. 11 8 11 6 121 3. (3 2 ) 3 729 4. 5. Student Outcomes Students understand that the sum of two square roots (or two cube roots) is not equal to the square root (or cube root) of their sum. Students convert expressions to simplest radical form. SOLVING EQUATIONS BY COMPLETING THE SQUARE s There are several ways to solve an equation by completing the square. Two methods begin by dividing the equation by a number that will change the "lead coefficient"
First Degree Equations First degree equations contain variable terms to the first power and constants.